What is a rotator cuff repair? 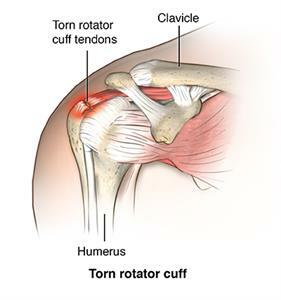 The rotator cuff consists of muscles and tendons that hold the shoulder in place. It’s one of the most important parts of the shoulder. It allows you to lift your arm and reach up. An injury to the rotator cuff, such as a tear, may happen suddenly when falling on an outstretched hand or develop over time due to repetitive activities. Rotator cuff degeneration and tears may also be caused by aging. If your rotator cuff is injured, you may need to repair it surgically. This may include shaving off bone spurs that are pinching the shoulder, or repairing torn tendons or muscles in the shoulder. 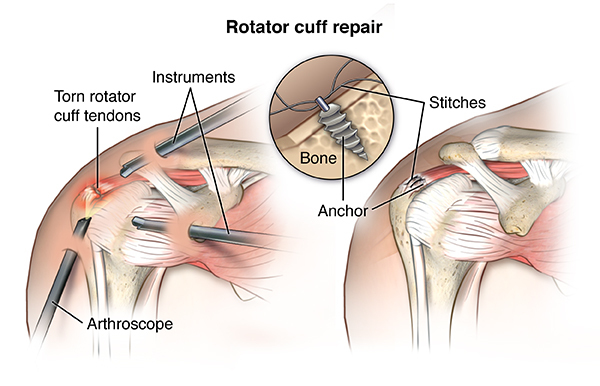 Surgical techniques that may be used to repair a tear of the rotator cuff include arthroscopy, open surgery, or a combination of both. The goal of rotator cuff repair surgery is to help restore the function and flexibility of the shoulder and to relieve the pain that can’t be controlled by other treatments. Why might I need a rotator cuff repair? 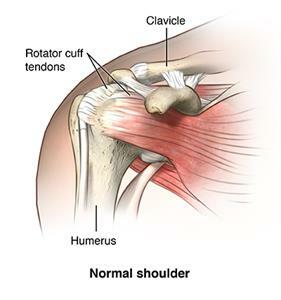 Strains or tears in the rotator cuff. Inflammation of the bursa (bursitis) in the shoulder. Inflammation of the tendons (tendinitis) in the shoulder. Recurrent pain, limited ability to move the arm, and muscle weakness are the most common symptoms. Rotator cuff surgery may be performed using an arthroscope. An arthroscope is a small, tube-shaped instrument that is inserted into a joint. It consists of a system of lenses, a small video camera, and a light for viewing. The camera is connected to a monitoring system that allows the healthcare provider to view a joint through a very small incision. The arthroscope is often used along with other tools that are inserted through another incision. An open repair may be performed if the rotator cuff injury can’t be repaired using arthroscopy. In some cases, a tendon graft or joint replacement may be needed. There may be other reasons for your healthcare provider to recommend rotator cuff repair. What are the risks of a rotator cuff repair? The joint pain and weakness may not be relieved by the surgery. You may not recover full range of motion in the shoulder joint. Nerves or blood vessels in the area of surgery may be injured. This results in weakness or numbness. How do I get ready for a rotator cuff repair? 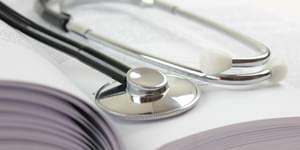 In addition to a complete medical history, your healthcare provider may perform a complete physical exam to make sure that you are in good health before undergoing the procedure. You may undergo blood tests or other diagnostic tests. You may receive a sedative before the procedure to help you relax. Because the sedative may make you drowsy, you will need to arrange for someone to drive you home. You may meet with a physical therapist before your surgery to discuss rehabilitation. What happens during a rotator cuff repair? Rotator cuff repair may be done on an outpatient basis or as part of your stay in a hospital. 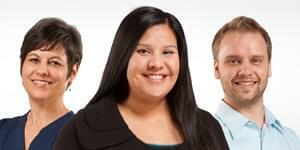 Procedures may vary depending on your condition and your healthcare provider’s practices. Rotator cuff repair may be done while you are asleep under general anesthesia, or while you are awake under local or regional anesthesia. If regional anesthesia is used, you will have no feeling in your shoulder. The type of anesthesia will depend on the specific procedure being done. Your healthcare provider will discuss this with you in advance. The skin over your surgical site will be cleansed with an antiseptic solution. Your healthcare provider will make an incision in the shoulder area. The incision will vary depending on the type of surgery (open surgery, arthroscopy, or a combination of both) that may be done. The arthroscope (if used) will be inserted through the incision. Injured tendons and muscles will be repaired or replaced with a graft tendon from another part of the body. Bone spurs (if present) will be removed. The incision(s) will be closed with stitches or surgical staples. What happens after a rotator cuff repair? After surgery you will be taken to the recovery room for observation. Your recovery process will vary depending on the type of anesthesia that is given and the type of surgery that’s done. The circulation and sensation of your arm will be monitored. Once your blood pressure, pulse, and breathing are stable and you are alert, you will be taken to your hospital room or discharged to your home. You may be given an immobilizer or sling before you go home. Once you’re home, it’s important to keep the surgical area clean and dry. Your healthcare provider will give you specific bathing instructions. The stitches or surgical staples will be removed during a follow-up office visit. To help reduce swelling, you may be asked to apply an ice bag to the shoulder several times per day for the first few days. You should keep the sling or immobilizer on as directed by your healthcare provider. Your healthcare provider will arrange for an exercise rehabilitation program to help you regain muscle strength, flexibility, and function of your shoulder. You should not drive until your healthcare provider tells you to. Other activity restrictions may apply. Full recovery from the surgery may take several months.